Skateboarding is going through one of those phases where its popularity seems to soar and soar. With so many kids deciding to give four wheels and a piece of wood ago, there should be no surprise that more and more skateboards are finding their way into the market place. What is noticeable at the moment is how many complete set ups are available on the open market. Traditionally, serious skateboarders have pieced together their own set up, sourcing their preferred trucks, deck, grip tape and wheels to create their perfect board. It has to be said that those days are gone. Putting together your own set up has got harder and harder with less outlets offering this sort of possibility, and complete set ups are getting better and better. The quality certainly shines through with some brands, and Powell Golden Dragon are one such manufacturer. On this occasion we are taking a look at the Steve Caballero endorsed PGD Caballero Ink Complete Skateboard (Gold, 7.625 Inch) which really does feel like the real deal. We’re talking high quality which is not something you always expect for a complete set up, but we’ve been blown away this time around! Let’s look at this set up in some detail. This board feels right from the first moment you stand on it. There’s just the right flex in the board, and you can feel the pop before you’ve even tried to bust out any moves. The Gold Dragon Trucks give the deck plenty of structure underneath, and a quick look at the construction tells you all you need to know about the longevity of the parts. This is a complete set up which is built to last. The deck comes with 99a hardness super high rebound formula 54 mm wheels which are a great size for a beginner or intermediate board. The board is also a great shape, which encourages plenty of tricks with lots of pop and a concave shape which helps the board stick to the feet like glue. This is a great complete set up. The look of the deck is fantastic, with fantastic graphics on the underside, and the endorsement of Steve Caballero is not going to do sales of this product any harm at all. The fact that there is a warranty with the board gives plenty of reassurance, So we’ve got great looks, great build quality, an endorsement from a top skater and plenty of pop in the deck, meaning that any newcomers to the sport will still get plenty of enjoyment out of this deck even when they progress to intermediate level. For a budget price, this complete skateboard set up offers so much value for money and style, it’s a hit with us! 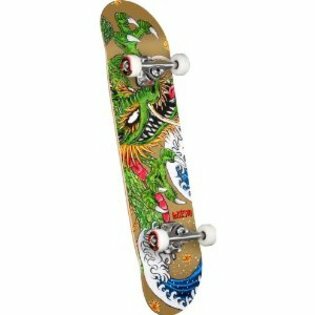 This entry was posted in Powell, Reviews, Skateboarding, Skateboards and tagged PGD Caballero Ink Complete Skateboard, Powell, Powell Golden Dragon, Skateboard. Bookmark the permalink.